Members of the College’s Title III Grant team include, from left: front row, Ron Schneeman, mental health intern; Daniel McCamish, data analyst and director of institutional effectiveness; Jena Frommeyer, Student Success coach; and Anita Stanley, assistant to the vice president for Academic Affairs; back row, Sara Ressing, Student Success coach; Ruth Clark, administrative coordinator, Academic Affairs; Dr. Cole Dawson, associate vice president for Academic Affairs; and Jennifer Cornell, Title III project coordinator. 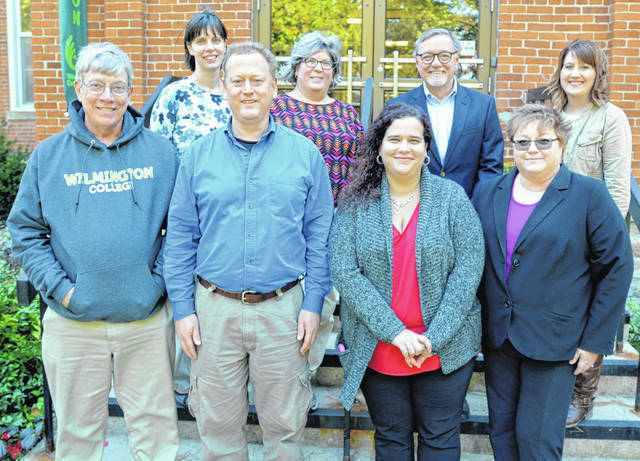 WILMINGTON — The U.S. Department of Education awarded Wilmington College a $115,000 grant designed for addressing students’ financial literacy, protecting free speech and fostering civic responsibilities. The supplemental, one year award complements a previous federal grant received in 2016 that is bolstering the College’s support for at-risk students with an emphasis placed upon retaining them through graduation. Indeed, WC recently began year three of the $1.9 million Title III grant spread over five years to leverage data analytics in the design and implementation of more effective retention programming. Title III is a federal program of the Department of Education designed to assist institutions of higher education in serving low-income students more effectively. Jennifer Cornell, Title III project coordinator, said the additional funds would bring speakers to campus and enhance a variety of established programs over the next year. “By including a greater emphasis on financial literacy, the College expects retention rates to increase as students gain greater understanding of the long-term value of a college education,” Cornell said. She said the supplemental funding would enable the College to bring speakers and facilitators to campus who will provide ways and means for students to overcome adversity and foster open dialogue among diverse populations on sensitive topics. The College is implementing a series designed for a discussion of topics surrounding racial diversity and the LGBTQ community. Funds have also been allocated to provide more students with an opportunity to participate in annual trips taken to Washington, D.C., and the Civil Rights tour over spring break, which are coordinated by Chip Murdock, director of diversity and inclusion. The grant will accommodate broadening and making available the College’s longstanding Peer Mentoring Program to all students. Historically, this program paired successful African American students with new freshmen in helping them navigate their first year at WC. The expanded program will now include workshops related to financial and civic responsibility. In addition, the First Year Experience course, which is required for all freshmen, will have supplemental educational materials and an additional focus on financial literacy as a result of the grant. Seniors will now have individualized financial counseling available to them with an emphasis on the student loan repayment process and how that fits into personal finance and budgeting. Cornell cited the “exemplary work” of Murdock and Jena Frommeyer, Student Success coach, as they “ jumped in at a moment’s notice,” and provided major components of the successful grant proposal. Also, Dr. Marta Wilkinson, associate professor of English, played a key role with the First Year Experience class and Senior Financial Literacy Seminar components of the proposal. “Securing these supplemental funds provides the College with a unique opportunity to combine efforts that offer integrated support to increase student engagement and financial literacy,” Cornell said. With an ambitious goal of increasing overall student retention and graduation rates by 3 percent in five years, the College is administering the original Title III grant for strengthening technology and hiring additional academic and mental health professionals, as well as offering more professional training to faculty and staff involved with retention efforts.